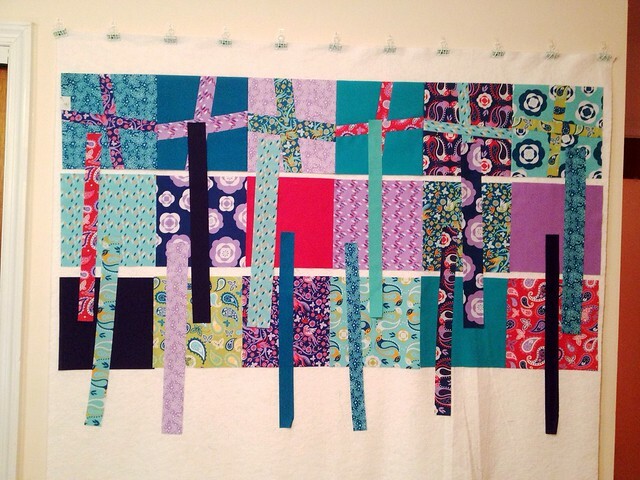 So here are some "in progress" pictures of the Wonky Cross quilt. I really liked this one, because I used a couple new techniques this time! 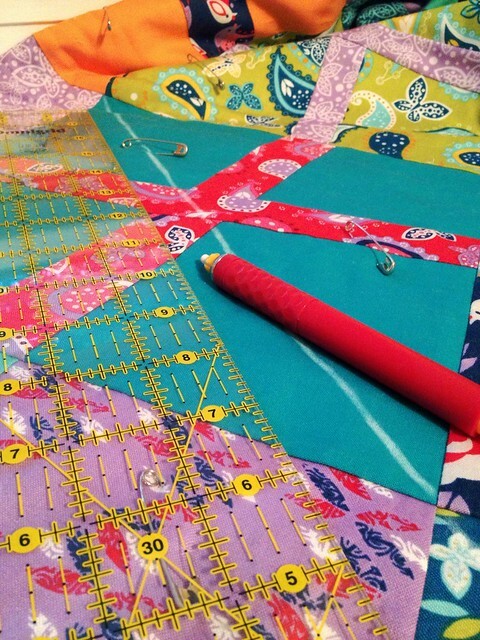 I started with this pull - I didn't buy ANY new fabric for this quilt! I think that's a first ;-) The FQs on the left are a set that I got quite a while ago, but never decided what to do with them. 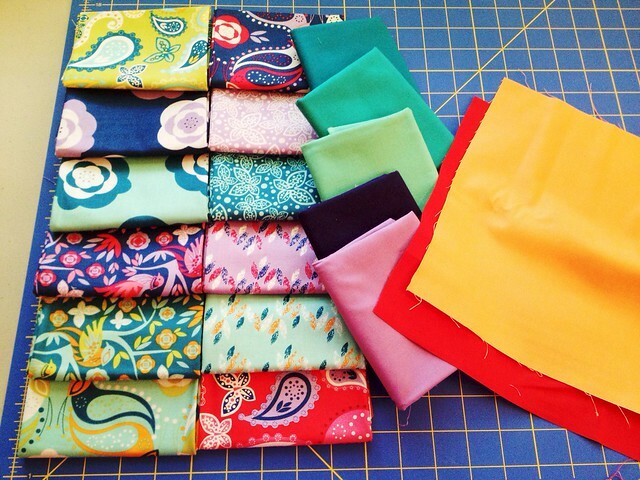 The solids are all from my stash, the teals are from this block from a few weeks ago. I did straight line quilting like I've done a bunch before, but this time I did a little different pattern. I used a bar guide and made the lines about 3/4" apart in a large cross pattern. I drew some lines in chalk through the blocks so that I would know where to turn so that the corners of the lines would line up just right. 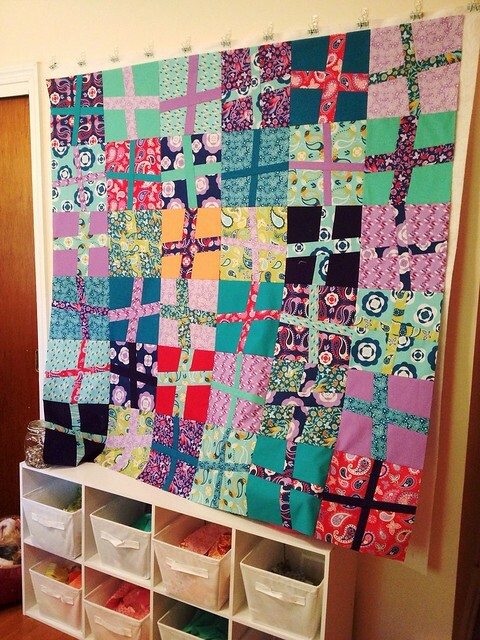 I already mentioned that I did a pieced back, and I also did the binding by machine as well. 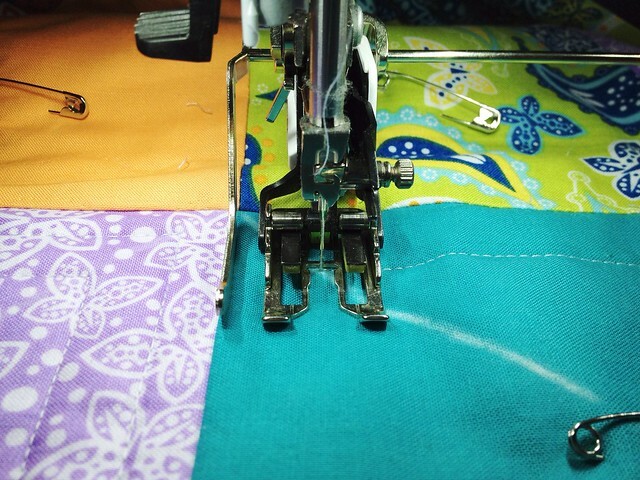 The binding was SUPER fast by machine! I only did it this way because of the time crunch - I finished it at about 430 in the morning on Saturday, and was meeting my friend that same day to give it to her. I like it ok, it definitely speeds things up! I don't like how the stitch line shows up on the back, so I'm going to have to work on getting the binding to be the same width on the front and back. Or closer, at least! 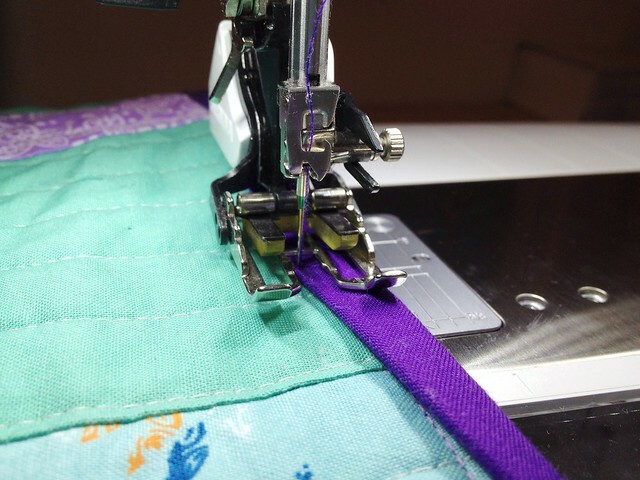 When turning your binding to the front of the quilt, make sure you LINE IT UP with the *stitches* made from when you sewed the binding to the back. My, what a nice stash you have!! t really did turn out great. Congrats again! This is fantastic! 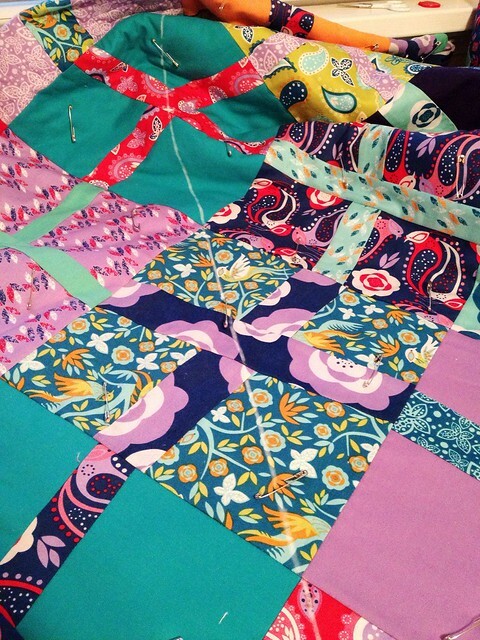 I will show the photo of your finished quilt top to my modern quilt group tonight - I am actually teaching them improv piecing, including wonky crosses. Awesome finish! I gave up on machine binding after I FINALLY learned how to hand bind, but I did have some nicer results with machine binding by doing what the first commenter suggested about the stitching lines from the back, plus, if you choose a decorative stitch, something besides a zigzag but not too fancy, it looks much better!